Today and tomorrow highlight life in Israel: Tragedy and triumph. Today is Israel’s Memorial Day, where we remember and shed tears for the 25,578 people who fell in defense of the country. Tomorrow we rejoice as we celebrate Israel’s 65th Independence Day, the amazing rebirth of the Jewish people in the Jewish homeland. Our foundation is proud to have Israel as a base of activities. Over the last five years, we have worked tirelessly towards the full inclusion of all Israeli citizens with disabilities into society. The latest studies estimate that there are approximately 1,000,000 people of working age with disabilities living in Israel- there is much work still to be done. 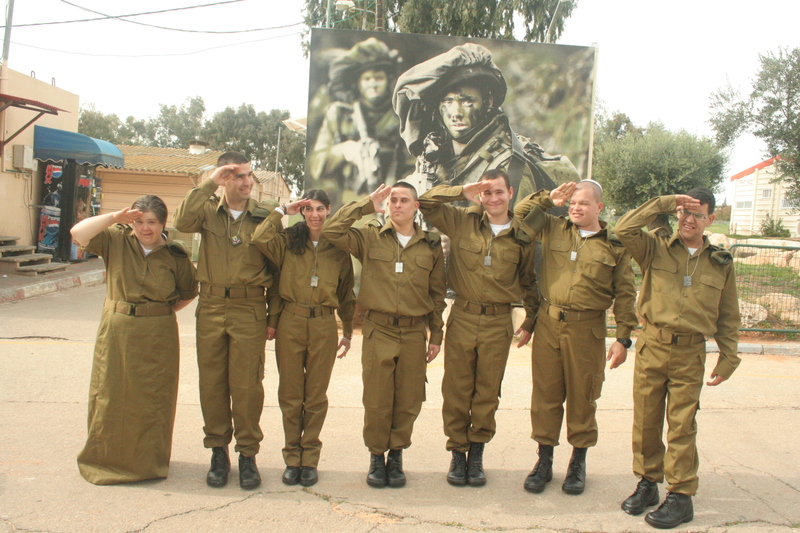 “For most young Israelis, service in the IDF is a normal part of life in the years between high school and college. Service becomes a core rite of passage in Israeli society and an empowering, transformative experience. AKIM is working now to make that experience open to people with intellectual disabilities, enabling them to perform significant supportive and productive tasks as part of IDF service. This project works with both the individual and the rest of the military unit to maximize adjustment and success. The program has been a success- the soldiers with disabilities adapted well and the benefits for both the soldiers and the army were very evident. The IDF has now proposed to initiate a recruitment process in order to offer civil positions within the army and opportunity of permanent enlistment in the standing army to the released soldiers with disabilities. As Israel moves forward, we will continue to impact and strengthen Israeli society, a society which will become fully inclusive and everyone can contribute. 244 and 41. Those two numbers amaze me. Our foundation announced the 2013 Ruderman Prize in Disability eligibility guidelines 5 weeks ago and on Monday, the applications process ended. When I awoke Tuesday morning, I was astounded: 244 applications were submitted, a 41% increase over last year! From Cambodia, South Africa, Canada, Argentina, France, USA, Israel, Russia, UK, Brazil and more. A thank you to our many partners who helped spread the word to as many Jewish communities as possible so we can recognize the fine work being performed by local organizations. I am encouraged that there are so many innovative programs around the world working towards the full inclusion of people with disabilities in Jewish communal life. I want to personally thank everyone who took the time to fill out the application and share with us how you are making your community more inclusive. Now the hard part for our staff begins: Choosing only 5 winners from among a pool of very worthy candidates. This initiative is meant to recognize past work in inclusion. There is still much work to be done so that every person with a disability feels welcome in his/her community. But seeing so many people around the world dedicated to this issue gives me hope that we are on the right path to full inclusion. Read our last post: But Words CAN Hurt Me! We are proud to support Transitions to Work, in collaboration with Combined Jewish Philanthropies and Jewish Vocational Service (JVS). They work to train and help young adults with disabilities enter the workforce while simultaneously engaging the corporate and business community to increase employment opportunities for individuals with disabilities. Here’s a wrap up of a program that just ended. It is great to see how everyone benefited- participants and their mentors. 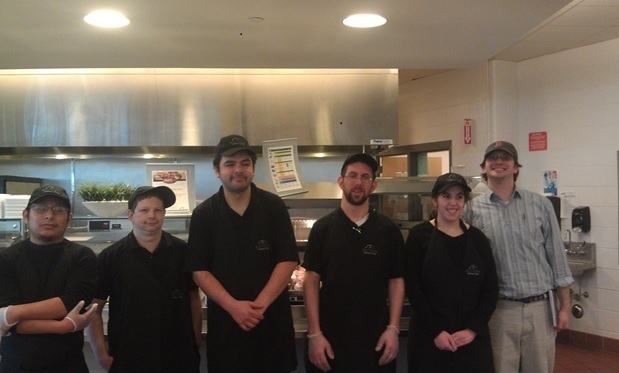 Five Transitions to Work participants recently graduated from a three month training program at Whitsons School of Nutrition in the Newton, MA North High School. The participants received classroom instruction in job readiness issues and gained hands-on work experience and training. The work included customer service, food preparation, food portioning and back of the house support positions. April Liles, Food Service Director – Newton Public Schools Whitsons School Nutrition, is a big supporter of the program. April mentioned that Whitsons saw this experience as an opportunity to partner with the community and it turned out better than even anticipated. The participants arrived every day, on time, eager to work and learn, and became members of the team. “The experience was amazing for Whitsons, the participants, and all involved. We would do it again in a heartbeat”. Periodically we offer you glimpses into excellent and innovative inclusion programs from all corners of the Jewish community. Today I’m happy to bring you a post about a wonderful program run by Gateways, a Boston organization with which my family has been deeply involved since its inception. It can be hard to get teen inclusion programs right, but we believe Mitzvah Mensches has done just that. I hope this inspires you to think about starting your own inclusive philanthropy and social action program—or tell us about the one you already have. Jewish Disability Awareness Month highlights the issue of inclusion of people with disabilities in all aspects of Jewish life. Here in Boston, Gateways has a teen youth initiative – Mitzvah Mensches – that strives to include teens with disabilities in meaningful Jewish extracurricular activities. Mitzvah Mensches is an inclusive teen youth group fostering young philanthropists. We create a social life through social action. Teens join Mitzvah Mensches for a variety of reasons– but one thing is for sure: they all think it’s fun, they all feel like they belong, and they all have a voice that is heard and counted. The overt curriculum at Mitzvah Mensches is about philanthropy and social action. Teens tell us what they are interested in and we find charities that are aligned with their interests. As a group, we learn about the charities in fun and creative ways. Sometimes, it looks like formal learning (reading and writing, or watching a video about an organization), but often we incorporate games and team challenges into the evening. The games have a secondary (covert) purpose: through them, we work on social skills and building relationships among the participants. As an inclusive program, some of the Mensches have disabilities and others do not. A diagnosis or disability is not so important. What is important is that the teens make connections with one another. In the beginning of the year, the teens may feel they do not share interests or have much in common, but as the year progresses and the program creates unique shared experiences, the teens bond and have things to talk about. Eventually those connections grow stronger and friendships are forged. Now in its eighth year, the group meets twice a month during the school year and includes students with and without disabilities. So, while wonderful activities, posts and celebrations of awareness carry on during Jewish Disability Awareness Month, the teens of Mitzvah Mensches will be celebrating a slightly different agenda: acceptance, individuality, and inclusion of all. Nancy Mager is the Director of Jewish Education Programs at Gateways: Access to Jewish Education. She can be reached at nancym@jgateways.org. What Do You Value in Jewish Life? Today I’m pleased to bring you a post by one of the founders of Jewish Disability Awareness Month, Shelly Christensen. 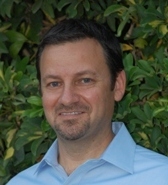 Shelly has been in the forefront of the Jewish inclusion movement for many years. Here she offers ideas for examining our own feelings and assumptions about Judaism and disability—an important exercise for each of us, this month and all year. We recognize Jewish Disability Awareness Month (JDAM) for only the fifth consecutive year. In that short span, Jewish communities across North America have adopted JDAM as a call to action. Yasher koach, we say to each other as we hold a Shabbat of Inclusion, invite participants from a group home to services, or invite a speaker to give the sermon on disability issues. Each activity tagged with the JDAM logo means that someone is paying attention and observing that there are many people with disabilities and mental health disorders still living on the margins of Jewish life. We must sincerely and with integrity work towards the day when any Jewish person who has a disability can be a valued member of the Jewish community, not by platitudes, but by recognizing that individual’s gifts, strengths and desires to live a Jewish life. Think for a moment of all that you have come to value by being a member of your Jewish community–whatever form that takes. Do you have a picture of that in your mind? Imagine if none of that existed for you; that you could see others doing what you want to do through a clouded window. Imagine if all you love about belonging to your Jewish community was not destined to be yours. How would your life be different? You would be denied access to all you value and never have the opportunity to choose what your own participation would be. So it is for many Jews with disabilities and their families. We have a responsibility to take action beyond Jewish Disability Awareness Month. Inclusion does not happen just because we know it is the right (and Jewish) thing to do. It happens because people who believe that each human was created in the Divine Image know that when one person is left out from belonging, we are not finished with our work of inclusion. There is much to do, and the clock is ticking. As an advocate for and practitioner of Jewish community inclusion across the lifespan in all facets of Jewish life, I have been privileged to be a partner of many Jews, of all ages, who sought inclusion, membership and to simply “belong” to the community. Inclusion is possible. We can do this when we set our course, determined to adapt our attitudes and beliefs so that all may belong. Each of us is responsible for each other. What can and will you do? In this special edition of Zeh Lezeh today I want to share the worldwide announcement of the 2013 Ruderman Prize in Disability. The following press release was sent all over the globe, and we are already seeing interest from Jewish communities in Rwanda, Fiji, and the Netherlands—among many others. We excited about the buzz the Prize is generating, and look forward to receiving applications from excellent and innovative programs that will inspire our community to an ever greater dedication to inclusion. Newton, MA (February 10, 2013) Ruderman Family Foundation President Jay Ruderman today announced the launch of the 2013 Ruderman Prize in Disability, its second year, which will provide $250,000 in funding to recognize innovative programs and services that foster full inclusion of people with disabilities in the Jewish community worldwide. The $50,000 awards will be given to five organizations that work in the disability arena, serve those in the Jewish community, and actively champion inclusion in their work. In June, the Foundation awarded $200,000 total to ten organizations. The Foundation received over 150 applications representing seven countries. The Ruderman Prize recognizes organizations for exemplary existing initiatives rather than making grants for new programs. The application form for the awards is available on the Foundation’s website. Submissions are due on March 18 and winners will be announced in May. The Ruderman Family Foundation is dedicated to creating and promoting innovation that fosters inclusion of people with disabilities in the Jewish community and Israel. As you may know, February is Jewish Disability Awareness Month (JDAM). It was founded in 2008 by the Jewish Special Education Consortium and this year we are hearing about schools, congregations, and communal organizations marking the occasion with celebration and reflection. You can check out the JDAM Facebook page here. Below, our colleague Jennifer Laszlo Mizrahi takes the opportunity to reflect in a JTA op-ed on the state of inclusion in Jewish organizations in the United States. What are you doing for JDAM? Judaism teaches us that when we were slaves in Egypt and really needed help, God’s instrument was a person with a disability: Moses was “slow of speech and tongue.” But with tremendous assistance from Aaron and the proper supports, Moses led the Israelites out of Egypt and into freedom and the Promised Land.